Piloting a Curtiss B-18 biplane, he flew to 500-feet over Moanalua Polo Field, Oahu. He repeated the flight the next day to the thrill of thousands of spectators. On December 19, 1910, a “real birdman” arrived in Honolulu aboard the Manchuria. Whipple Hall, agent for the Curtiss Aircraft Company, debarked with an excitingly strange proposal. He announced that within a week two airplanes and men to fly them would arrive by ship. Honolulu’s imagination was stirred by Hall’s words. Residents looked forward to the arrival of the men and flying machines. Announcements continued in daily newspapers, plus features on flying. On December 27, 1910, J. C. “Bud” Mars, pilot for the demonstrations, arrived on the Wilhelmina. Their strange looking metal birds were taken to Samuel Damon’s Moanalua polo field for assemblage. Each was a pusher craft with propeller and engine behind the pilot; there was no cabin or compartment for the man. Bud Mars had the reputation of being the most daring flyer in the United States. A case was cited to the press of him swooping under the bridges across the Mississippi River. Tickets for Honolulu spectators went on sale at the Empire Theater, the M.A. Gunst cigar store and the Alexander Young Hotel, at one dollar each. One airplane was assembled by December 29th, two days later, all was in flight readiness. People arrived on the scene by auto, bus, carriage, drawn by horses, bicycles and afoot. Most of the 3,000 fans that paid admission charges were in full attendance at Moanalua polo field. Hundreds more gathered on surrounding hilltops. The tent hangar was filled with curious people observing the plane’s odd assemblage of spruce, ash, bamboo, steel tubing, and rubberized silk wing covering (an invention of Baldwin). Several feet wider than the ordinary Curtiss biplane, Shiver’s design gave it about 30 feet of wing span, its wings five feet wide and the same distance apart. By Captain Baldwin’s watch, it took Mars nine seconds to get airborne. Thousands of people burst into a yell of approval to see their first airplane flight. They were watching history being made in a feat—unknown to them at the time—which would alter the destiny of Hawaii and, along with other places, the world. Climbing to 500 feet, Mars flew to the hills then back over Moanalua field. Within minutes, he brought the airplane to a standstill on the ground and the crowds gathered in close to see the new hero dismount his iron bird. The test flight was a complete success. The group then set up a christening ceremony, with the designer’s wife doing the honors. There was no champagne available but someone went to get some by motorcycle. When it arrived, Mrs. Shriver christened the plane “Skylark,” as Mrs. Mars stood by elated at her husband’s performance. Watching the flight activity, one local boy referred to Mars’ airplane as “Pinao” (Hawaiian for dragonfly.) Another cried out, “Aloha, Mokulele!” (sky-boat, aircraft). Mars made several flights that day. As the biplane with its gigantic winds swept over the grass field and rose into the air there was a general whoop of exultation and spontaneous applause from spectators. Curtis B-18 biplane made of spruce, ash, bamboo, steal tubing and silk; piloted by J. C. Bud Mars. Took 9 seconds to get airborne and climbed to 500 ft before landing safely. JC Bud Mars’ biplane was christened Skylark after its maiden flight. Bud Mars biplane on grass at Moanalua Field where approximately 3,000 people witnessed the 1st flight of a heavier than air machine over Hawaii soil. Mars landed in the center of the polo field after the flight and was interviewed and photographed by the press. JC Bud Mars’ biplane on his history making flight was an entirely new machine which had never been in the air before. It was christened Skylark after its maiden flight. Promoters sold tickets to Honolul spectators for $1 each. Some 3000 people paid the admin charge, and hundreds of others watched from nearby hillsides. Spectators lined the polo field as Mars flew over the field. Built in 1958, it’s still pretty young in terms of “historic property” (50+ years old.) But in 2004, in my role as State Historic Preservation Officer (SHPO,) I weighed in on the importance of keeping the structure intact. The church had its start as a chapel for sailors in World War II and now serves the surrounding community, including military personnel. Once you see it, you immediately recognize and appreciate its importance. Its feature is a stained-glass window that covers one whole wall of the A-frame building; it’s described as the “largest connected stained-glass window in Hawaiʻi” and one of the largest stained glass panels in the United States. You get no sense of the uniqueness of the window from the outside; but once inside … Wow! The unique stained glass window was designed in 1957 by John Wallis, formerly of the Wallis-Wiley Studio located in Pasadena, California. John Wallis was a prolific and notable stained glass artist who worked in the medium for over 70 years. A map of Pearl Harbor, aircraft and ships depicting battles from the Revolutionary War to World War II and military insignia are there, along with Jewish, Muslim, Hindu and Confucian symbols. An article in the Honolulu Advertiser dated October 26, 1959 called the window: “… a tribute to all of the men and women of our military services – both dead and living who have defended American freedom in times of national emergency”. Stained glass in the window consisted of 140 separate sections, each filled with 12 to 20 individual pieces of hand painted imported and domestic glass. 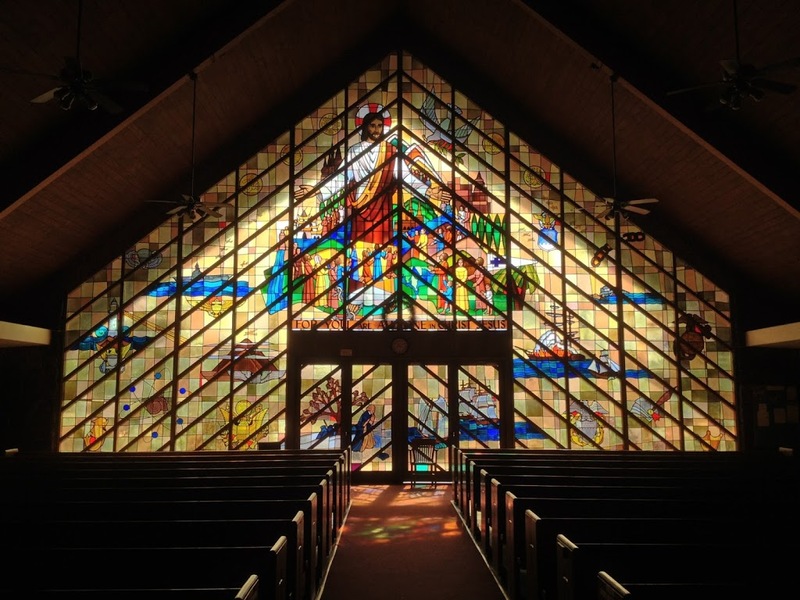 The entire A-frame front consists of the stained glass wall panel including the double entrance doors. The only other stained glass window in Hawaiʻi designed by Wallis is located in Saint Andrews Episcopal Cathedral. The first service in the church was held on July 20, 1958; although the stained glass window was not it place at that time. After the stained glass window was in place; a dedication ceremony for the church took place on Sunday August 24, 1958. On September 3, 1958, at a celebratory dinner, an elongated hexagonal-shaped “time capsule” was sealed in the pavement at the front entrance to the church and marked with the date 1958. From 1941 through 1945, prior to the establishment of the Pearl Harbor Memorial Community Church, the congregation met at a WWII Navy chapel located in the Pearl Harbor Housing Area 1, later known as Hale Moku. The congregation was officially organized on April 28, 1946 when the twenty-five member church council drew up a commemorative scroll and a Navy chaplain was installed as pastor. The scroll, which currently hangs in the church, is entitled Navy Housing Congregation and lists the original twenty-five council members and over eighty signatures of the original members of the congregation. Approximately 250 attended the dedication service in a large Quonset hut, in addition to 200 children attending the Sunday school. In 1948, the name of the church was changed from Navy Housing Congregation to the Pearl Harbor Community Church. 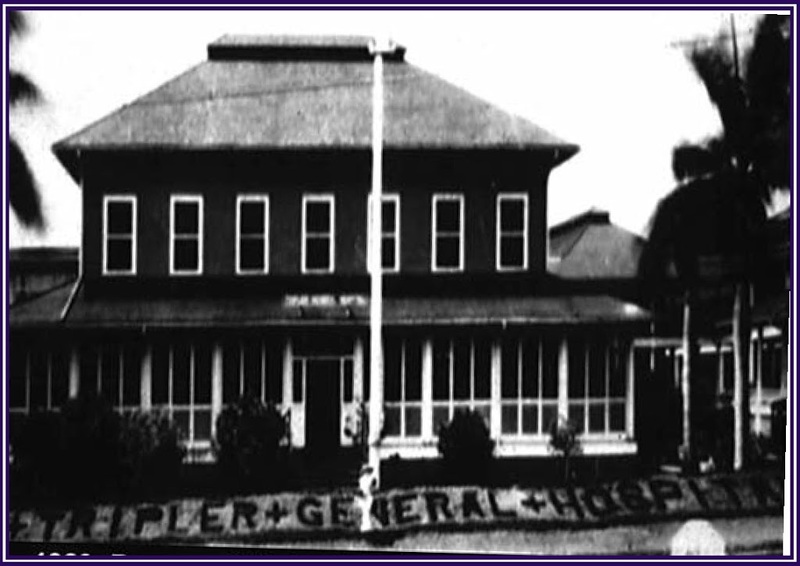 The original congregation consisted of military families from the nearby Pearl Harbor Naval Base and the Marine, Army, and Air Force installations as well as civilians who were employed at these installations. The church was the only Protestant church in the Pearl Harbor area serving the five major Protestant denominations. In the 1950s, approximately 15,000 people resided in the area including over 4,000 military families. In the 1950s, Congress did not appropriate Navy funds for churches to employ chaplains or build houses of worship. As an alternative, the Navy offered 25-year lease terms for a plot of land in the amount of $1 to several religious groups. In 1954, Rear Admiral CE Olsen referred to the church as the “Pearl Harbor Memorial Church.” The first formal suggestion to call the church the Pearl Harbor Memorial Community Church, in honor of those who died during the attack on Pearl Harbor, was made by WM Adams, Chairman of the church Building Committee. On January 2, 1957, a lease was signed between the United States of America and the Hawaiian Evangelical Association of Congregational-Christian Churches for a 3-acre lot in the “Johnson Circle, Interim and Public Housing, Moanalua Area, on behalf of the Pearl Harbor Community,” and adjacent to the newly constructed Moanalua Shopping Center. On October 27, 1957, an official groundbreaking ceremony was held at the church to celebrate the beginning of the construction. Prior to 1971 only one congregation, the United Church of Christ, occupied and used the church. Then, Lutheran Church of Pearl Harbor, Seventh Day Adventist, New Cup of Freedom Church (known today as the Samoan United Church of Christ,) New Life United Pentecostal Church, Young Rak Korean Presbyterian Church, and Kanana Fou-United Church of Christ (Samoan Congregation) began to share the facilities. The church is open from 8 am to 8 pm, Sundays – they have one service after another. In addition, there are weeknight services. Altogether, about 600 people attend services in a week. The image shows the Moanalua Community Church stained glass window. In addition, I have added other images in a folder of like name in the Photos section I have added other images to a folder of like name in the Photos section on my Facebook and Google+ pages.